As I took a walk through the new subway entrance at Atlantic Avenue on Monday, the fact that I was essentially strolling through a giant advertisement was not lost on me. 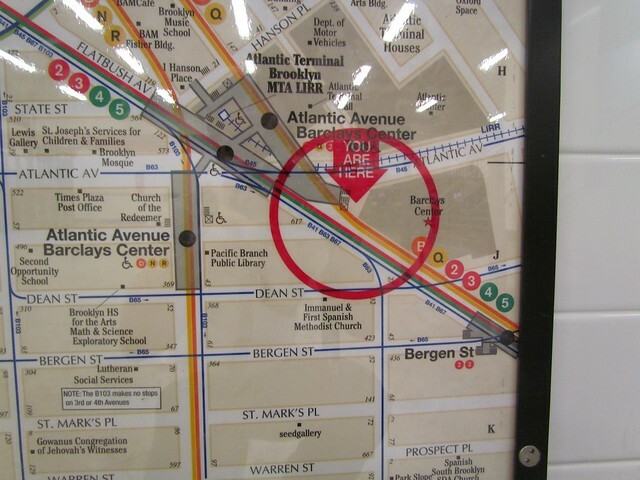 Barclays is paying the MTA $4 million in 20 installments over the next two decades to keep its name on the Atlantic Ave. station complex and the subway map. Even as it serves as an identifier of what will become a major destination for Brooklyn-bound subway riders, it’s still advertising. Over the years — actually the decades and even the century — New Yorkers have grown accustomed to advertising in the subways. Billboards have long decorated the station walls, and while old advertisements in vintage trains seem quaint by comparison to today’s staid placards, they’re still ads nonetheless. They’ve been there since nearly Day One, and they’ll continue to be there long into the subway future. Lately, the MTA has beefed up its advertising offerings. With a lucrative deal in place with CBS Outdoors, the MTA has expanded advertising tremendously. Video boards outside of stations flash dynamic ads while station takeovers — particularly at Times Square and Grand Central — see the walls plastered with posters. A Shuttle train gets its monthly wrapping, and even staircases and turnstiles carry corporate sponsorships. Now, Metrocard fronts and backs are for sale, and for the MTA, this means dollars. Earlier this week, David Dunlap of The Times explored the proliferation of advertising underground. The MTA, he found, has upped its advertising revenue to $120 million from $106 million five years ago and just $38 million 15 years ago. As the subways have been slowly modernized, ridership has spiked and safety has improved in leaps and bounds, advertisers are willing to spend dollars to attract captive underground audiences. Advertising dollars, Dunlap notes, now make up one percent of the MTA’s budget. That is, once again, where we are. The ads are indeed everywhere, and we accept it. Some become conversation pieces of parts of New York City lore — Dr. Zizmor, anymore? All in all, they have endured as a balm for hurt minds. We pay in ads or we pay in dollars. The choice is an easy one. The ads are far too large and ubiquitous. It’s an assault on the senses. The ones on the stairs just make me dizzy. All this for only 1% of the budget? Raise my fare 1% instead and ban ALL advertising from transit and transit stations. anyway, i would prefer to not see any ads at all, but we unfortunately live in an advertising-based society. ads fund many many things in our life, from our television viewing to our internet content (google and facebook are just giant targeted-marketing platforms). ad saturation is only going to go away if people start paying more for the things that the ads subsidize, and that just ain’t gonna happen. You’re right. Fares make up about 50% of the MTA budget. It would require a 2% fare increase. I too would rather pay a higher fare than have to see obnoxious, invasive advertising – incl all ads on bus windows, any flashing light ads, all changes of station names for monry. Barclays can drop dead. The Ads are a necessary evil (Provided they don’t cross the line “Gentlemen’s Club” Ads on taxi’s come to mind. Almost no one wants to see small children looking at them). Lets be honest, there is a tremendous amount of work that still needs to be done (Not to mention Pension obligations and the like), and things will become more difficult going forward. Some are the MTA’s fault (Outlandish projects a failure to prioritize, poor public relations), some are not (Inflation, the eventual rise in Interest Rates, and commodity prices come to mind), but it is what it is, the dollars must come from somewhere, and this is just one avenue. I don’t mind the ads, and can even enjoy them. They give me a nice distraction on my commute. I agree. They also add a bit of personality to the stations. NYC Subway station tend to be too prosaic most of the times. So Barlcays is paying $4 million per year? Or $200,000 per year times 20 equals $4 million? thats ALL they’re paying for that? I think thats way too low. Yah. It’s been discussed a bit, but that’s what the market bears right now. There’s very little appetite for subway station naming deals as evidenced by the large number of transit agencies searching for deals and the relatively paltry number of deals in place. As a point of reference, though, AT&T paid SEPTA $1 million per year for the rights to completely rename the Pattison Station to AT&T Station. Here, the MTA wanted to retain some of the original name and thus couldn’t get as much for it. Plus, AT&T could have been competing against others whereas here, Barclays was the only suitor due to the arena. Might as well be managing the Mets. At MTA rates maintaning the signage will cost that much. At those rates, advertizing is an unneccessary evil. absolutely it is. perhaps to match the nice low cost of the land deal? Curious why the MTA never reprogramed those LCD tv’s on the newest IND cars to play ads instead of a stock messages we have seen since their inception. If tv’s bring in more ad revenue than just a static ad/image, why not use them? I completely agree, I think these have huge potential and are being very underused / undersold. Personally, when I look at them I often ponder if they could be used for something that would make riders happy and the MTA money. For example, what if they displayed sports team rankings or something along those lines …. in a sponsored fashion. Hell, sponsored trivia, sponsored poetry, the possibilities are endless. I’m confident sponsored content would help attract more eyeballs to the screens to keep riders attention locked on the advertisers branding which delivers them true value. Anyone interested in an interesting documentary/advocacy piece about visual clutter and its effects on the human psyche should check out the film This Space Available (http://thisspaceavailablefilm.com/). Persons who don’t like visual clutter shouldn’t live in cities. On-topic for this subject — and via today’s New York Times — here are the subway ads the MTA definitely does not want in the system: A court order will require the MTA to begin putting acitvist Pamela Geller’s anti-jihad ads in 10 New York City subway stations. Lots of positions you can take on this one vis a vis security versus free speech rights, especially in the wake of last week’s riots overseas. And while the focus right now on the Atlantic Avenue-Barclay’s Center station is on the new arena, the people who will be going there and the corporate sponsorship-related ads, Atlantic-Barclay’s is also the home station for Brooklyn’s largest Arabic community (and was the target station for the failed 1996 NYC subway bombing plot). I would say if the MTA is smart they would keep Geller’s ads as far away from Atlantic-Barclay’s Center as possible to avoid making the controversy any bigger than it already is. I’d bet Geller doesn’t ride the subway, and would love a bombing. Ironically, I find the wrapped subway cars better looking than the unwrapped ones. It’s actually nice to have some color instead of plain chrome color everywhere. Have you visited Longacre Square recently? I’m sure you have, but you know it by a different name these days – Times Square. Publisher Adolph Ochs got the City to rename it in honor of his paper, the NY Times. It remains Times Square to this day. The subway is not dignified? How elitest. Transit systems globally be them subway, bus or train based sell ads to generate revenue & there’s nothing wrong with that considering the MTA is at the wims of polititions who see the agency as an entity that can be continuesly abused & battered. I thaught the Giants vs Cowboys wrapped shuttle train was really cool with the color & shading of turf on one side & Giants logos all around. The subway hasn’t had a shred of dignity in quite some time…I’m not sure advertising is to blame for breaking the camel’s back. Bring back Dr. Z’s ads…. I’ve heard Dr. Z’s now into general dermatology. Who do I go to for the relief of hemorrhoids caused by all that advertising we’re subject to these days? its already online, inconveniently on the Weekender site. You could also buy those map at the Transit Museum store for a unreasonable price. The ads should go. Keep the subways simple, or (when budgets allow) design with artwork as has been done in other cities from Moscow to Stockholm. Think outside the box. Consider that Sao Paolo successfully banned all outdoor billboards. Moscow has beautiful artwork and very low fares. The difference is that the government is willing to subsidize their system heavily. Same in Sweden. This is the US… not going to happen. There aren’t enough ads. There need to be more ads. The MTA needs to find a way to make transit closer to profitable without pilfering revenues from unassociated sources. Zone travel pricing and/or ads on every surface. Zone travel? That would add much unnecessary complexity to everyone’s commute. And a massive investment in new readers etc. And would be hugely unpopular in outer boros. I like ads. They help me keep up with what movies are coming out. Who cares? You read a magazine – advertisements. You watch television (unless you are watching a channel you paid extra for) – advertisements. Visual pollution??? Visual pollution to me is graffiti and trash… not an advertisement that I can quickly scan and decide whether I want to read more or not. Unless someone wants to donate the money that the MTA makes in advertising – then I don’t care.